Autumn is the season of allergies, with its abundance of pollen, dust and seed. While the “fruits” of the garden can make us miserable, there are also plants that offer a solution for the ills. Natures supplies what you need, when you need it. Common garden herbs like thyme, sage and mint that can be used to offset the effects of hay fever and sinusitis that occur with an allergic reaction. The best all round herb is Thymus vulgaris.It is avery important tonic herb for strengthening the immune system and for fighting fungal and respiratory infections. It is particularly useful for helping the body to fight throat and chest infections, because the leaves are strongly antiseptic and contain thymol, an effective antifungal. Thyme may also be helpful in hay fever and may be used with other herbs, like echinacea, sage and German chamomile for mild asthma, and can be taken alongside conventional treatment. Make an infusion of the leaves and sipping it like a tea. However, one should not drink three cups of thyme tea a day for longer than a week as it may influence iron absorption. Thyme is a bushy little perennial is frost hardy, needs full sun, tolerates poor soil and responds well to regular trimming. It grows about 30-cm high, and also does well; in a pot. Don’t overwater or let the water stand in the saucer under the pot. Sage (Salvia officinalis) is at its best right now because of the warm, dry days. It also has antifungal and antiseptic properties and this in combination with its relaxing and astringent actions makes it ideal for most types of sore throats. It is widely used as a gargle as well as a mouth wash for ulcers. It also clears catarrh from a post-nasal drip. Like thyme, sage is a bushy perennial, growing about 30cm high. It has greyish green leaves that are very aromatic. Sage doesn’t like water on its leaves or waterlogged soil. Trim the bush after flowering to retain its shape. To make a standard Sage infusion add 3 teaspoons fresh leaves to one cup boiling-hot water. Infuse for 15 minutes. Take one cup three times a day. Mint, especially Peppermint (Menthapiperita) has decongestant, antiseptic and mildly anaesthetic effects if used externally as an inhalant to relieve colds, catarrh, chest infections and asthma. Peppermint has dark green leaves, sometimes tinged with purple, and it has a spreading growth, typical of all mint. It is not as vigorous as normal garden mint but may still be invasive. It also does well in containers. It grows in full sun or partial shade and likes regular watering. There are also lesser grown herbs that are just as effective in alleviating allergies and infections, like elderflower, goldenrod and echinacea. Elderflower (Sambucusnigra) grows into a graceful shrub or small tree with creamy coloured flowers and dark red berries that are rich in vitamin C. It is often recommended by health shops as a remedy for chronic post nasal drip. An infusion or tincture of the flowers can be taken internally to strengthen resistance to sinus infection, for stemming chronic mucus flow from the sinuses, ear infections, allergies and hay fever. If taken preventatively for a few months beforehand, the severity of hay fever attacks can be reduced. Goldenrod (Solidagovirgaurea) is more regarded as a hardy perennial for mixed borders but its flowers are also used with elderflower and thyme in preparations to combat sinus congestion and catarrh. It can also be used as a mouthwash. Goldenrod grows up to 70cm high, with branched spikes of golden yellow flowers that attract pollinators. It does best in full sun and may die down in winter but will shoot in spring. It is a clump forming perennial that spreads fairly quickly. 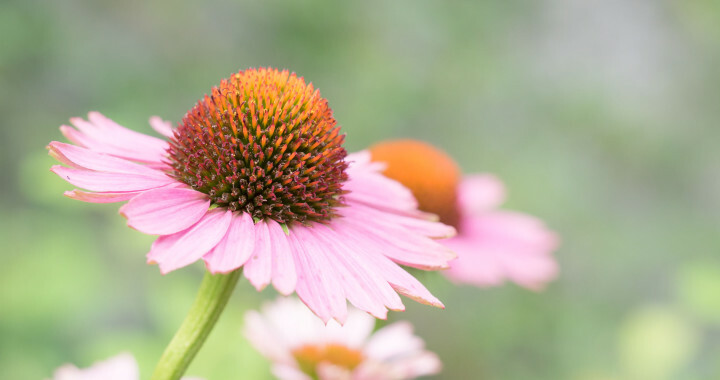 Echinacea purpurea or Purple Coneflower is also a beautiful garden perennial that herbalists regard as one of the most important medicinal herbs. Because it stimulates the immune system, it is helpful in alleviating both bacterial and viral infections, like colds, flu, throat infections and other respiratory problems as well as allergies such as asthma. The large deep pink daisy-like flowers with prominent central orange or brown cone are carried on single strong stems in summer. They are used to make infusions. The roots, which are harvested in winter, are used for decoctions or tinctures. Posted in Healing Herbs and tagged allergies, autumn, beneficial, health, herbs, Organic, prevent.